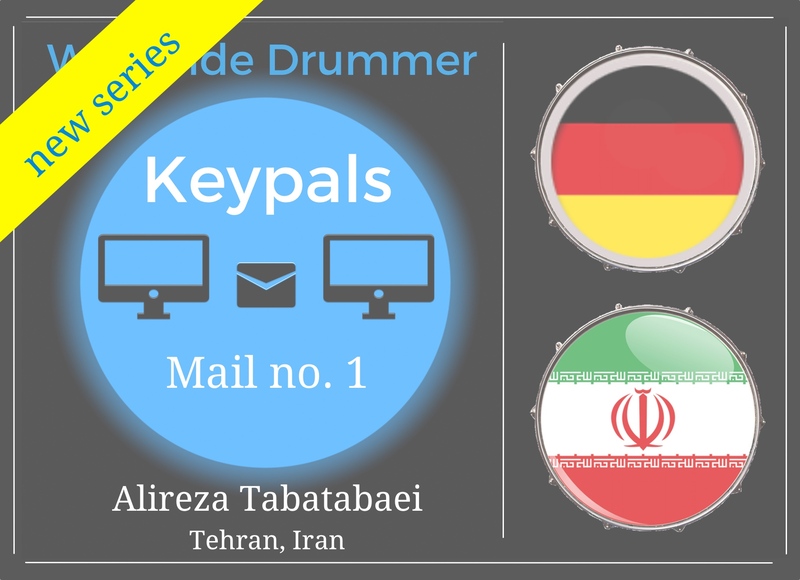 Hey Music Lovers, I’ve got a new series for you: Worldwide Drummer Keypals. 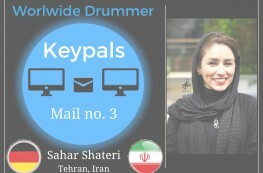 My first keypal is Alireza Tabatabaei from Tehran, Iran. What do you know about people drumming in Iran? Are there professional drummers? Is there even a scene? Many questions, many answers. Read on and find out. I think we have something in common: you are a drummer, I am a drummer. We share that great passion for rhythm, I guess. Maybe there is even more? Why don’t we find out? Let’s get to know eachother a bit more, shall we? My name is Cat. Right now I work as a feeelance journalist and musician. Actually, since January 16th, 2016 I can call myself a blogger, too: I launched my first blog called CAT with HATs. 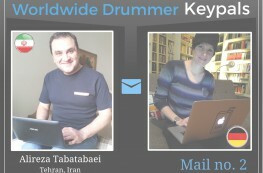 On there you are and will be able to find posts about drummers and percussionists from all over the world. Maybe for now more from Germany, but one trip after another, right? Can’t do it all … at once. I myself grew up with music mostly composed by Germans, Americans and Brits. I started to widen my musical horizon in the middle of my teenage years. But only later, when studying drums at the Los Angeles Music Academy, I truly dived into the wide world of music and into a peculiar drumming world. Back home in Germany this drumming world was mainly characterized by drummers from Europe and the United States of America. Obviously I don’t know about drummers in most parts on Earth. However, so far music has introduced me to some truly wonderful people, as well as to some amazing places on this planet. I’d like more of that. And I’d like to visit and see things with my own eyes and ears. Of course that’ll be of advantage for my readers, as I mostly have my photo and video camera with me. Certainly I am not travelling all the time – neither am I playing with Taylor Swift, The Stones, nor have I won the lottery, yet. But even from home it’s possible to get to know foreign people, cultures and ways of life and rhythm. Well, and Iran is one country I haven’t visited yet. To be honest, at the moment it’s not on top of my list. Even though my old English teacher went there by chance a few years back and returned very fascinated. Yet, I doubt that I would feel safe there. But maybe my fear is ungrounded. That is also a reason why I am writing you. I would like to know more about Iran from a native. And here you are on top of my list. Where to start? How about the beginning? When did you start to play the drums and under which circumstances? How did drums enter your world? Have they always stayed there? What exactly are you doing now? I am looking forward to your reply. And I am sure, I will have many more questions after that. Take your time and take care! sorry about the delay! In about 25 days we do celebrate the New Year here and thus I am up to my ears with work. I won’t worry much about grammar and spelling here. Hopefully, you’ll be able to understand (note: Alireza replied to me in German. I translated his words into English). For my fourth birthday my father hired an Armenian band to get the party going. In those days, the Armenians in Iran were Christians, who knew more about western music and who also had mastered their instruments. That was the first time I saw a drummer live behind this wonderful instrument. The whole night I stood at the same spot, right next to him. Even when it came to unwrapping my presents, I wouldn’t want to leave. And I believe it was back then when I decided: „I want to become a drummer“! Shortly after that, in 1979, the Islamic revolution started. Everything Western was prohibited, including drums and music in general. But at home of course we continued listening to music. My mother loved music and my older brother used to always get a hold of the latest music at the black market: Accept, Iron Maiden, Scorpions, Judas Priest and many more. Had the morals enforcers caught somebody with music tapes during those days, the consequences would have been chicanes and a long trial with financial penalty. And let’s not mention the musical instruments. One year later the Gulf War between Iran and Iraq began and everything turned even worse. As a 12-year-old child, due to brainwash at school and through TV, I was interested in guns and tanks. Therefore my parents decided to send me abroad. For my father dealt with repair parts of Mercedes, he had good connections and friends in Germany. 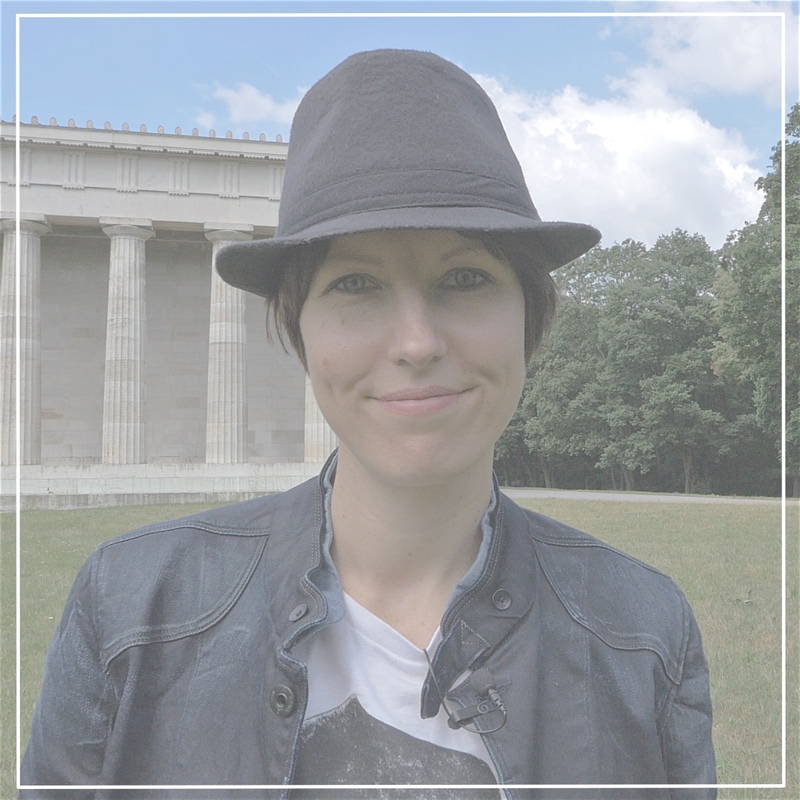 That’s how one day I found myself at the North Sea boarding school in Sankt Peter-Ording – in my head still drums, to which I was getting closer now. During the first six months I only studied German, then finally I was allowed to go to school. On my first day of school I saw an elegant, red drum set, waiting for me at the auditorium. It blew me away! The same day I ran to the administration office to ask how to get even closer to that instrument. They told me: „No problem,“ and that I should talk to the music teacher. The school had its own big band called “West Coast Big Band” and I was part of their next rehearsal. I am never able to put into words, how I felt back then: incredible! The drummer of the band was of my age and showed me the basic 8th note beat. His name was Mateo Vandi, a very nice guy with Italian roots. Later he gave me some lessons and charged five German Marks for it. He also taught me how to play a bossa nova. With West Coast Big Band we had some local gig as well as some out of town. I always sat right next to Mateo with claves, tambourine, triangle or libra slap in my hands, ready to catch the accents. Whenever there was nothing going on at the auditorium, I was allowed to get behind the kit and practice my beloved 8th note groove. For hours I played the only groove I knew. I felt like in heaven. The war in Iran got worse day by day and one day the missile strikes on Tehran started. And so my mother and sister as well came to Germany. We rented an apartment in Norderstedt / Henstedt-Ulzburg, which is north of Hamburg. Thus I also changed schools. At the local high school classical music outranked rock and pop music by far. For example did the school own a storing place full of violins and violas, but the drum set was an old one from the 1950s. Again on day one I found out where the drums were stored exactly and how to get to them: at the backmost corner. From day one the responsible music teacher attempted to keep me away from rock music and tried to convince me that classical music was so much better. Very soon it turned out that he also happened to be my music teacher. Despite his discouragement together with some mates I started a schoolband. We had some gigs at school, as well as close by. In 1988 the war was over and according to my dad it was time to return home. My only condition for me to go back to Iran was this: my drum set had to be set up in my room. That required quite some effort and costs. Only with bribe it could be brought through customs in Tehran, for it was still forbidden to play or own an instrument, not to mention importing one. In the summer of 1987 and 1988 there has been a fantastic and unique series about drums in German television called Super Drumming. While it was the sunniest weather outside, I remained inside and recorded every episode onto two video cassettes. Later I hid them in my pockets and smuggled them into the Tehran airport. When I arrived in Tehran in the spring of 1990 there weren’t even a hand full off drummers there. Those from the days of the Shah, by now had gotten a hold of a different job. The up-and-coming only counted seven men. I was told terrible stories about how the morals enforcers destroy instruments, when they catch you on the streets or at parties. Therefore I took great care about my drums and made sure, nobody knew I owned and played an instrument. From his trips to Europe my father brought me home packs of sticks. Back then there were no music stores in Tehran. And I should mention that I was able to consider myself very lucky compared to my peers, to other Iranian drummers. There are many funny and sad stories from that period of my life, for example: many years after my return to Iran, I was asked, if I had heard about that wicked series Super Drumming. In 1997 the moderate Khatami became president of Iran and all of a sudden a gap for music opened. Now there was Iranian pop music and there were singers on the radio. Also no longer it was forbidden to own or play an instrument. A little bit later I became the latest member of the Arian Band, the first official boy and girl pop band of Iran. We worked together for 15 years, recorded five albums, toured the world and we even recorded a song and video together with Chris de Burgh. We also were summoned by the secret service, got beaten by the morals enforcers and were banned from working. 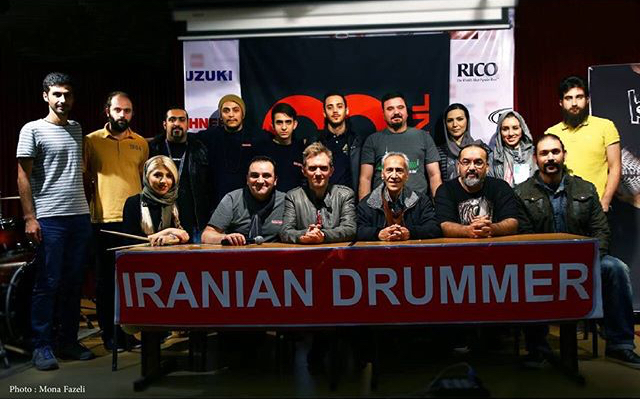 Every year I travel to Germany, to be precise to the Drum Department in Stuttgart, and gain some new knowledge which I then pass on in Tehran. 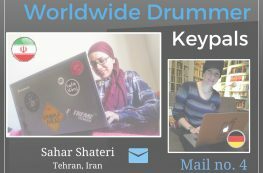 I founded the Iranian Drummer community, which has more than 1.500 registered users on its website. Since three years I organize workshops and masterclasses for the up-and-coming talents in Iran with mainly German educators. 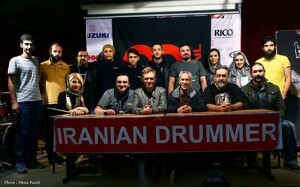 About nine months ago I opened the first real drum school in Tehran, which specializes on drums and bass. I am also the manager of the Arian Drum & Bass School, where I teach as well. 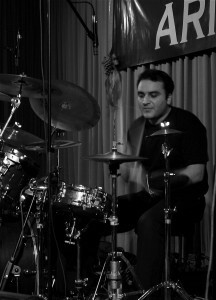 For Iranian Drummer I translate articles and interviews from mostly German drum magazines and keep in touch with the educators. For April of this year I am organizing a trip to the Musikmesse in Frankfurt and following drum lessons. That will be a premiere. I am curious about how many will actually receive a visa for Germany in these difficult times. There is so much to talk about, ups and downs. If you’d like to know more, just tell me and I get back behind my pc again.